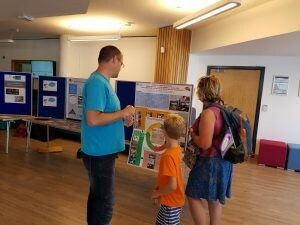 Researchers from across Bournemouth University (BU) hosted the Curiosity Playground event on 8th July 2017 as part of this year’s Festival of Learning. 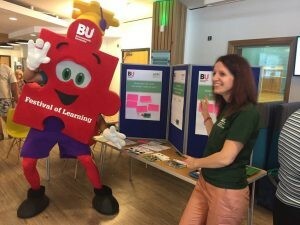 The aim of the event was to celebrate the diversity of research happening across BU and also included fun activities for children (and adults) to get them thinking. Dr Viola Prifti from the Centre for Intellectual Property Policy and Management got people’s attention with purple, orange and yellow carrots so that she could talk about food and intellectual property policy. Dr Henry Bang from the Disaster Management Centrediscussed his work on the lessons learnt from the recent Grenfell Tower fire. Dr Marcellus Mbah from the Centre for Excellence in learning used a jigsaw puzzle to talk about the role of community engagement within a University. 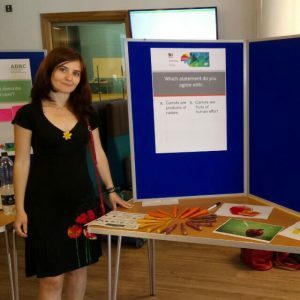 Dr Michelle Heward from the Ageing and Dementia Research Centre made life story sketch books with families to highlight the importance of knowing information about the person being cared for in health and social care settings. Thanks to those who took part in the event which was organised by the BU Research Staff Association (RSA). To find out more about BU RSA please come along to our next coffee morning on Wednesday 26th July 2017 at 10am in the Global Hub (DG68) at Talbot Campus.